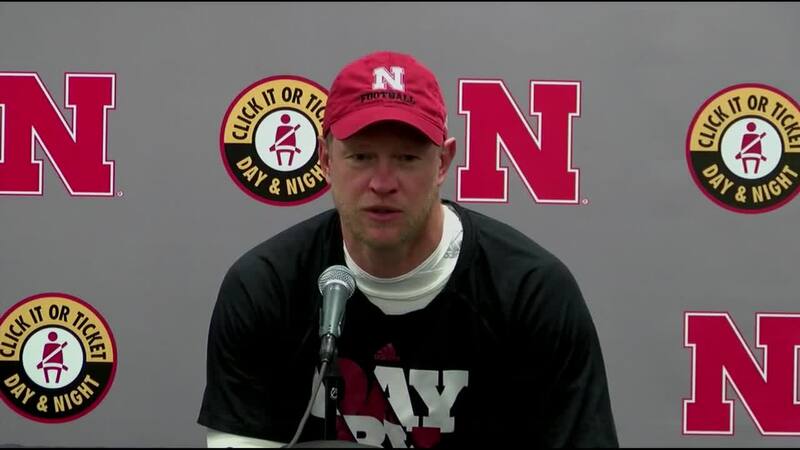 Huskers head coach Scott Frost speaks to the media following Nebraska's 31-28 loss at Iowa. Iowa wins its fourth straight in the head to head series with Nebraska on a last second field foal to win 31-28 on Friday inside Kinnick Stadium. The Huskers found itself down 28-13 in the fourth quarter, but were able to tie it up with just over three minutes to go. Iowa would capture momentum back to halt the Huskers comeback with the game winner. Both teams scored on its opening drives. The Hawkeyes scored on a passing touchdown from quarterback Nate Stanley to wide receiver Brandon Smith to put Iowa up 7-0. The Huskers struck back on its opening drive with a four yard touchdown pass from quarterback Adrian Martinez to tight end Jack Stoll to tie it. In the second quarter, running back Toren Young punched in a four yard touchdown to give Iowa a 14-7 lead. The Hawkeyes lead grew to 11 at one point when running back Mekhi Sargent scored on a 15 yard rushing touchdown. Pickering knocked in two field goals in this game. He made a 46 yard field goal as time expired in the first half to make it 21-13. In the third quarter, Sargent caught a five yard pass for a touchdown. That extended Iowa's lead to 28-13. After coming up with a fourth down stop on an Iowa fake field goal attempt, the Huskers took over and drove 98 yards to score a touchdown. Running back Maurice Washington's 25 yard reception made it 28-20. The Huskers converted on a couple fourth downs on this drive, the longest touchdown drive of the season. Late in the fourth quarter, Martinez would score on a three yard rushing touchdown. On the two point conversion, Martinez scrambled for what seemed like forever and found wide receiver Kade Warner to convert and tie the game at 28-28. But it would end in heartbreak for the Huskers, as Iowa kicker Miguel Recinos made a field goal as time expired to win the game for the Hawkeyes 31-28. Martinez went 26 of 28 for 260 yards and a touchdown through the air. He had 98 yards rushing and a touchdown on the ground. Wide receiver Stanley Morgan Jr. had seven receptions for 81 yards as he broke the all-time receiving yards record at Nebraska. Washington had seven receptions for 102 yards and a touchdown. Nebraska's season is over as they have no chance of qualifying for a bowl game. The Huskers final record on the year is 4-8.